When you've been annihilating the Olympic pool for the past 16 years, when you've won more gold medals than anyone ever, when you're the most decorated Olympian of all-time — when you're Michael freaking Phelps — you're bound to gain a fervent fan base, become a bonafide hero, and inspire an entire generation of young athletes to become Olympians themselves. 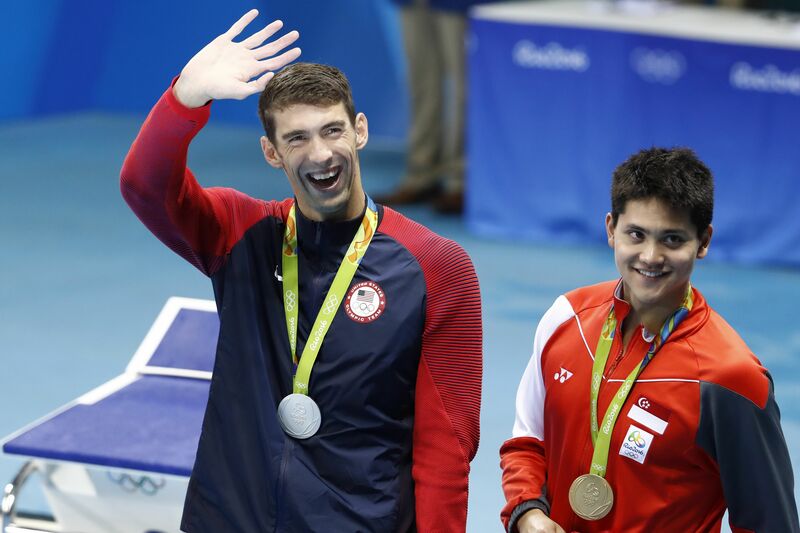 This was no more evident than at the 2016 Olympics in Rio, where gold medal swimmers like Katie Ledecky and Joseph Schooling shared throwback photos meeting Phelps when they were young fans. 19-year-old Ledecky, who won four gold medals in Rio and set two world records — her time in the 800 meter freestyle was otherworldly — was once just a wide-eyed fan of Phelps, as seen in the adorable old-school photo of a super-excited (and super-young!) Ledecky posing with Phelps at a meet and greet. Many years and many medals later, Ledecky is now the one doing the meet-and-greeting, posing with a fangirling Phelps as she signs a poster for him. The role-reversal is not just a nod to the endearing throwback — it's photo evidence that if you follow your dreams, you can achieve them. Sure, the sentiment is cheesy as all hell, but it's also inspirational. Without question, one of best parts of the Olympic games is watching these athletes — people who are the epitome of hard work and determination — achieve everything they've ever worked for. It's what makes the medal ceremonies so emotional, so powerful, and so inspirational: What we're seeing is the moment where every hour of training, every sacrifice ever made and every injury ever sustained, becomes worth it. These are the Olympic athletes who are inspiring kids all over the world to find their passion and do everything they can in order to pursue it. Kids who will see swimmers like Katie Ledecky and Joseph Schooling win gold for their respective countries will also see photos of them as tiny Michael Phelps fans — fans who who are now peers with their ultimate hero. It's mementos like those — and the updated photos in Rio — that are truly what the Olympic games are all about.